Running, during any season, remains one of the most accessible sports. A great addition to cross country skiing and snowshoeing, running has the advantage of not depending on snow conditions or locations. For those who have trained all summer, it’s a good way to maintain cardio and keep those muscles working! Here in Tremblant, we run during the winter for the children. This year again, hundreds of people will participate in the annual 24h of Tremblant relay race. A brilliant experience for anyone who likes to run! For those planning on running for fun, for training or even for good causes this winter, here are some tips: be well hydrated, clothed and have the right shoes! Being well prepared is what makes the experience more enjoyable. The best tactic to staying warm during a winter workout remains the multilayer. When you get too hot at the beginning of your run, you produce sweat and at the slightest gust of wind you’ll get cold. This is why we need to have easily removable layers. Also, remember to protect your extremities from the wind. Our head and hands are where the heat escapes from first. A thin neck warmer like a Buff can also help block the cold and moisture that can obstruct your breathing. On to shoes. 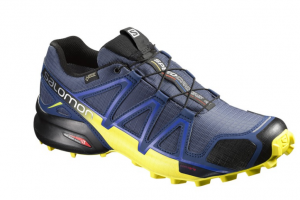 If you want to start off on the right foot (pun intended), we recommend a visit to our Salomon shop. You will find various models for men and women, such as the 100% waterproof GORE-TEX SPEEDCROSS 4 GTX which offers good protection against winter weather. 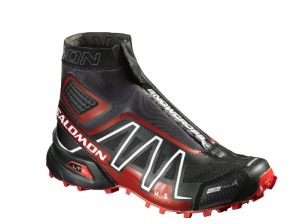 For better protection of the ankle, you may prefer the Salomon Snowcross model that is a bit higher. If you often run snowy or icy conditions, you could opt for studded shoes. However, if you’re used to running on asphalt, this type of footwear is not usually recommended. 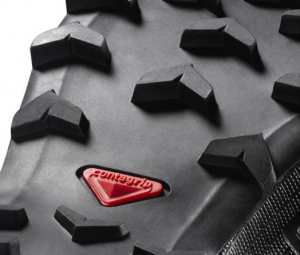 The Spikecross 3 CS and CS Snowcross are both studded and will ensure a better grip in rough weather. The foot should breathe so that there is no moisture and will remain dry. It is best to wear synthetic socks and choose a pair of waterproof shoes to keep your feet warm. In terms of maintenance, it is best to wash your shoes by hand with warm water and mild soap. Avoid the washer and dryer! For more information, we recommend a visit to our shop to discuss with our experts!